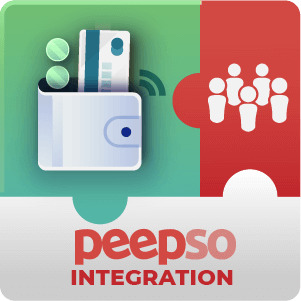 MicroPayment integration with PeepSo Addon supports adding a virtual wallet functionality to PeepSo social network. PeepSo is the next-generation of social networking plugins for WordPress. PeepSo allows you to create your own online community in just a few clicks. 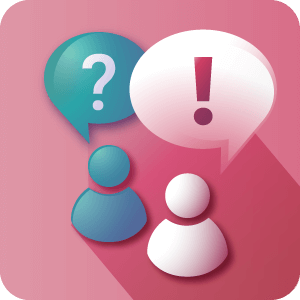 Create a profile, ask and answer questions and view a stream of activities. 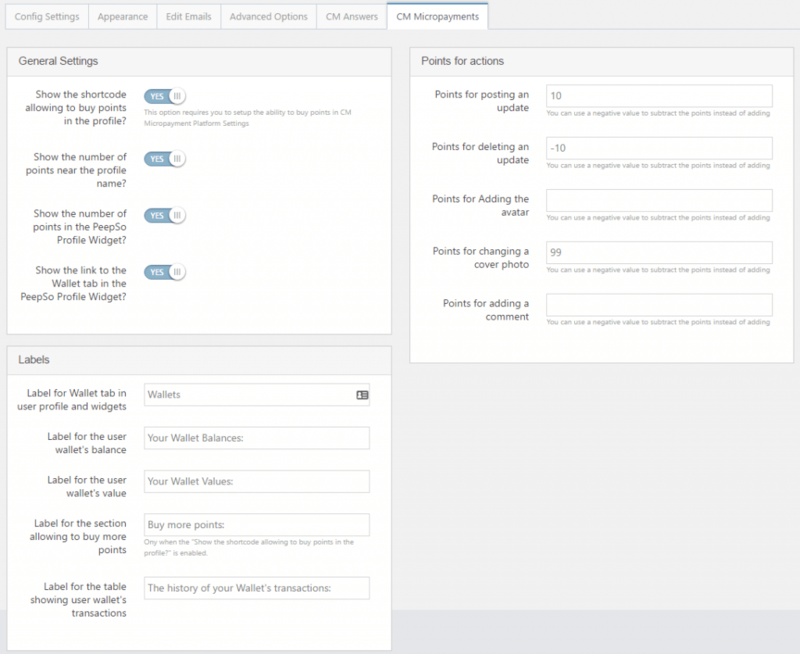 MicroPayments Platform Plugin is considered the most robust virtual wallet and currency solution for WordPress. Once MicroPayments is integrated with the PeepSo environment, it adds the ability to support member wallets and grant or subtracts points for actions done with PeepSo. These actions include posting comments, questions or answers in PeepSo. On the MicroPayment PeepSo addon config section, admin can decide which PeepSo actions will require addition or subtraction of virtual currency. 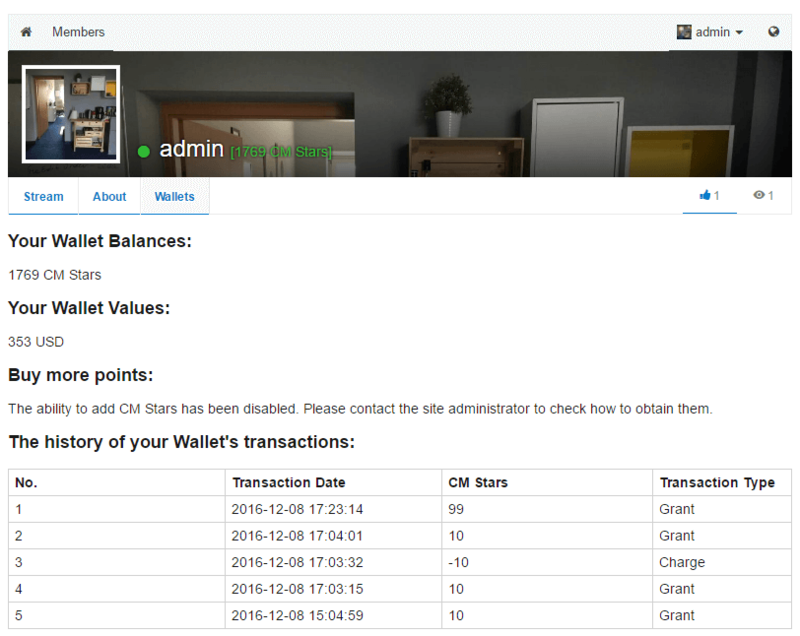 Member profile will include a new tab showing his transaction history together with his wallet status. With MicroPayments platform plugin you can define your virtual currency name, manually or automatically add virtual currency to your users wallets, integrate with WooCommerce or Easy Digital Downloads as a payment gateway or to charge users for purchasing virtual currency and much more. Can I use this to reward my PeepSo members points for performing actions withing PeepSo? Yes. This is one of the fundamental purposes of the add-on. 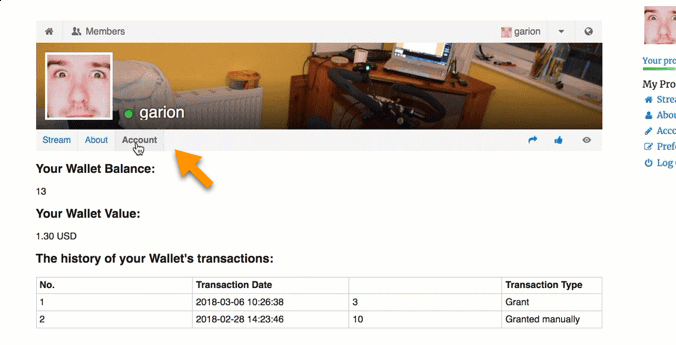 You can add PeepSo specific actions which when completed will credit the user’s wallet with micropayment points, the amount of which you can set. This can help encourage people to complete their profiles, post more often and comment on one another’s profiles. Can my PeepSo members view their transaction history through PeepSo with this? Yes. 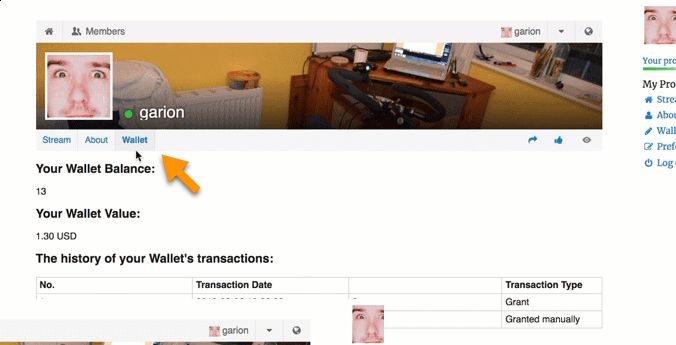 Within their PeepSo profile they will see a tab labeled Wallet. Clicking on this will bring them to a page that outlines their current wallet status and also includes transaction history. Can I change the text that appears in the Tabs on my PeepSo users profiles? Yes. This and all other text generated by the Micropayments Plugin or the PeepSo integration add-on can be customized to meet your needs. 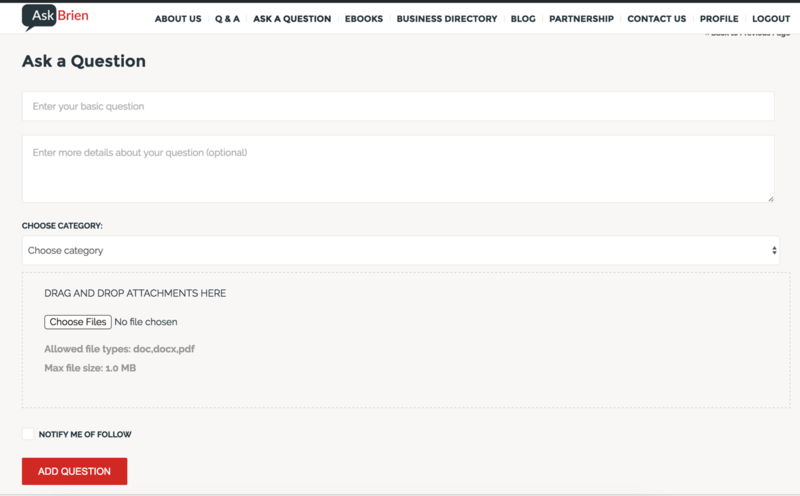 How does this work with the CM Answers Plugin? 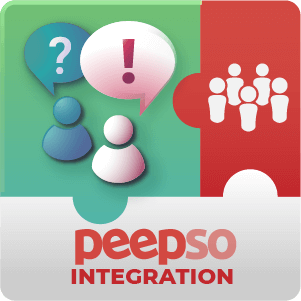 If you have both CM Answers and Micropayments and their integration add-ons installed, you can reward your PeepSo members for asking or answering questions within PeepSo. Is there any way to incentivize users who are Asking or Answering questions through PeepSo to keep going? Yes. With CM Answers and Micropayments installed you unlock the Badges feature which will display on a user’s profile after they have collected a certain amount of points in their wallet. This acts as a reward system and helps keep users engaged with asking and answering questions and using your PeepSo site in general. Can I allow my PeepSo users to buy points for cash through PeepSo? Yes. 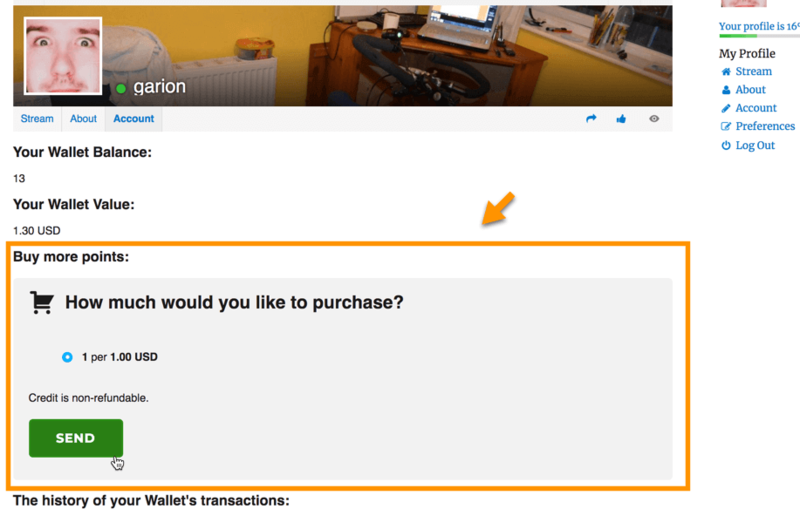 Allowing customers to purchase points either by card, paypal or via another payment gateway is supported. To enable this feature head to the Configuration settings (PeepSo → Configuration → CM Micropayments → General Settings).